Hounslow council is delighted that the new Chiswick Bridge has opened, linking the northern end of Chiswick Business Park to Chiswick Park tube station. The new bridge will significantly reduce journey times for pedestrians between the Business Park and the tube station and has already helped reduce some of the pressure on Gunnersbury Station which can get very crowded at peak times. 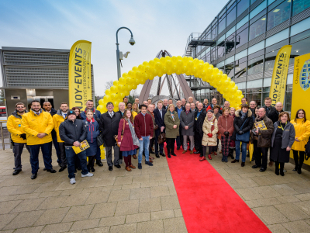 The bridge is the culmination of several years partnership working between the council, Transport for London (TfL), Network Rail and Blackstone (the developer of the park). The council stepped in back in 2015 when this project stalled and removed barriers to works starting to get it up and running as soon as possible. The bridge now forms part of the council's highway asset.